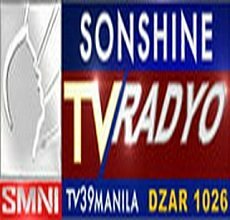 Religious TV Channel / Sonshine Media Network International (SMNI) is the broadcasting arm of a Philippine television evangelist, Pastor Apollo C. Quiboloy. Based in Davao City, it is available via terrestrial broadcast in the Philippines, and on cable, satellite, and online streaming worldwide. Its single television channel maintains 24-hour service through regular repetition of a dozen self-produced Kingdom Programs in English and Tagalog, along with news, public affairs and sports programs. It also maintains a network of radio stations under the "Sonshine Radio" brand of the Swara Sug Media Corporation. The main studios are located at JC Compound, Philippine-Japan Friendship Highway, Catitipan, Davao City and ACQ Tower, Sta. Rita Street, Guadalupe Nuevo, Makati City.